It might sound silly, but I wasn't a hat person until my Panama hat made me a believer this Summer. And now I am dreaming of felted fedoras, girlie beanies, floppy wool hats, & leather ball caps. Are you a hat person? 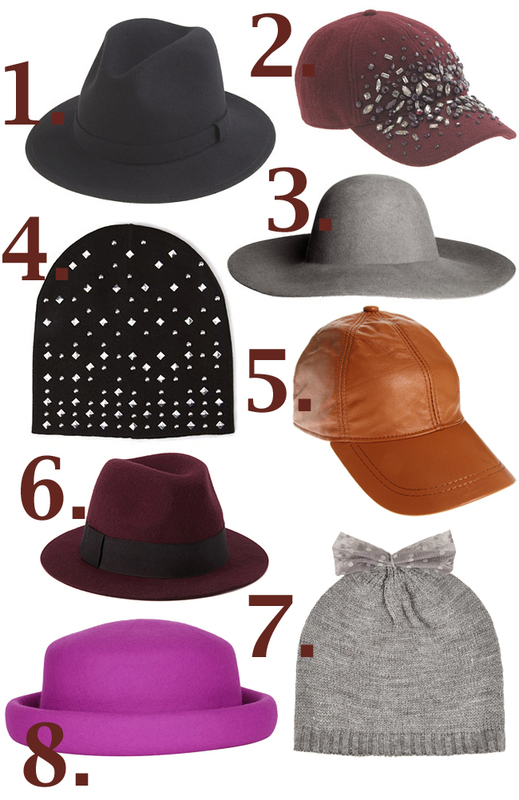 What is topping your hat wish list this season? Number two is seriously the prettiest baseball cap ever. I'd wear it. I am also kind of obsessed with that bright purple one. It's charming. Following you now! I'm not usually a hat person because my head is oddly small, but I am a new lover of girlie beanies!! That bow one is so cute! These hats are super cute! I am in love with the second burgundy hat with the jewels. I have the opposite problem! I just got a felt fedora from H&M and the L/XL size just fits around my noggin'! You really can't go wrong with some girlie beanies for Fall/Winter! A bedazzled ball cap could be a fun DIY too! I'm totally digging baseball caps at the moment. A leather one would be such a fab addition!! I scooped up a gray felted wool hat a few weeks back and I've been waiting for the temps to dip low enough to wear it -- also loving the faux leather one and all of your picks! I am a total hat person! My favorite hat is an Old Navy baseball hat that I have had for 15 years! I also rock fedoras a lot, I have 3 ;-) These are all great choices! Love #6 I have trouble resisting felt fedoras!